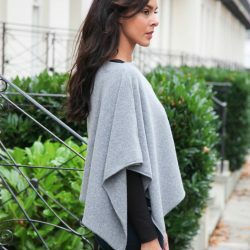 Ageless and timeless the Anise 3 ply 100% pure Scottish short cut cashmere wrap is one size, simply slips over anything from a pair of jeans to a dress, a T-Shirt to a jacket. An absolute essential for travel and is the perfect solution to chilly summer evenings. 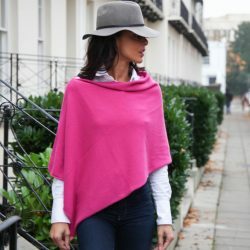 The wrap makes a perfect gift and will suit from a size 8 upwards. 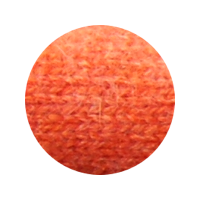 Category: Short Cut Cashmere Wrap. 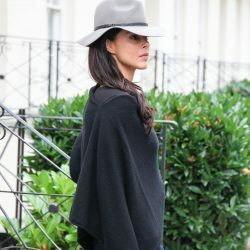 The Anise cashmere short cut wrap is a lighter, shorter version of our classic cashmere wrap. 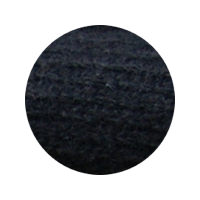 The wraps are knitted in Scotland and are 3 ply 100% pure cashmere, making a perfect solution to any chilly occasion. The wraps can be popped over a T-shirt to a jacket and pair of jeans to a dress. It simply slips over the head going across the body making a very elegant shape. Loose and free it is incredibly comfortable and cosy!